Hi ladies! I was contacted by Scandal Cosmetics recently to collaborate with them and to try out some of their latest products. Of course I said yes! I’ve used Scandal polishes over the years and if you live in Sydney or Melbourne I’m sure you’ve drooled over their colourful stands of polishes in cosmetics stores as I have! Over the coming weeks, I’ll be sharing swatches and some fun nail art using their products. They’ve also been very generous and each week there’ll be an exclusive offer for their online site for you guys! Today’s polish is from their Scandal Heart nail lacquer range which is my favourite collection. 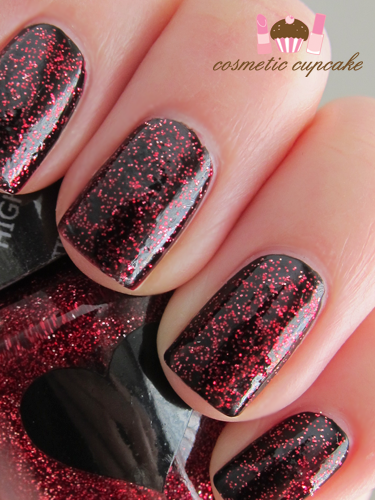 48 Red Sparkle is a gorgeous packed red and silver glitter in a dark wine red base. As soon as I saw it I knew I had to try it out! You know how much I love glitters! Application was great and the glitters applied very evenly on the nail, dry time was good too. I really enjoy using the brushes in the Heart range – they’re flat and wide and remind me of the OPI Pro-Wide brushes I adore so much except they aren’t as flat. Even the bottles look nearly identical! Here I’ve layered 2 coats of Red Sparkle over 2 coats of Scandal Blackline in 5804 Modern Black. Details: Scandal Heart nail lacquers are available from Scandal Cosmetics online store for a$4. This week’s offer! Use coupon code “cosmeticcupcake” between Monday 12th May– Sunday 19th May 2013 to receive a huge 20% off the entire site! For the month of May all orders will receive a free lipgloss too! This is a really pretty polish. I've never been a fan of red and black but this look is stunning. I think it's a great polish because you can layer it over different base colours for a different look. To be honest I'm not in the mood for black and red very often!! I asked Scandal Cosmetics and they say because there are so many polish colours you need to click on the colour and wait for the page to refresh to show the colour then add to cart. Hope that helps! You lucky thing. That nail colour is stunning. I like flat brushes too. Do you think it is suitable for Christmas time?